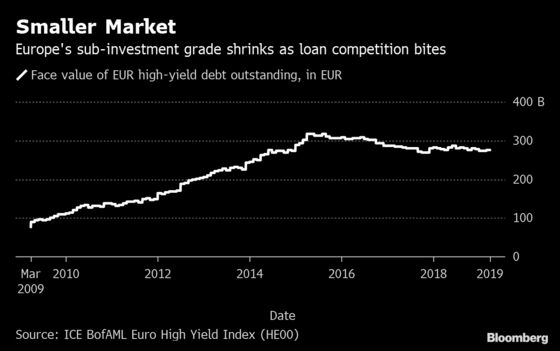 (Bloomberg) -- A raft of bond repayments is looming over Europe’s high-yield market, shrinking further the amount of investable debt amid lackluster new issuance volumes. Nexi Capital SpA, Worldpay Finance Plc and Perstorp Holding AB are among speculative-grade borrowers planning to repay outstanding bonds, which may hand back as much as 3.9 billion euros ($4.4 billion) of cash to investors, according to estimates by credit research firm Spread Research. Those narrowing spreads could spur opportunistic bond sales in Europe as price power swings back in favor of issuers. Last month saw Cemex SAB de CV, Faurecia SE and Sappi Papier Holding GmbH print new deals inside initial price thoughts on the back of strong demand. And a 700 million euro bond backing the buyout of Johnson Controls International Plc’s battery unit was also oversubscribed, despite concerns around loose terms. 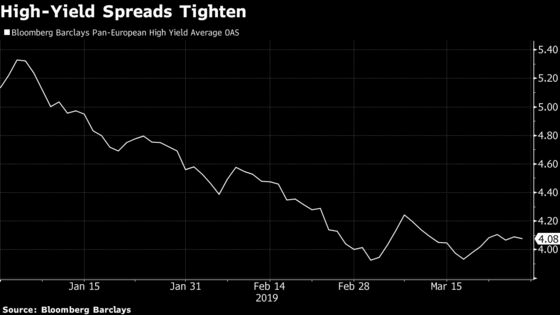 High-yield bond sales totaled 10.2 billion euros in the first three months of 2019, down 45 percent on the same period of last year, according to data compiled by Bloomberg. “Bond buyers have less and less supply from which to choose as borrowers predominantly turn to the loan market for fresh paper such as recap or M&As, and I don’t see that trend changing any time soon,” said Benjamin Sabahi, head of credit research at Spread Research. While supply dwindled, inflows have seen a resurgence. For the second time in March, high-yield funds saw a weekly inflow of over 500 million euros in the week ended March 20, bringing the year-to-date inflow to 2.7 billion euros, according to a March 22 research note from JPMorgan. This compares to outflows of 5.4 billion euros in the first quarter of 2018. These inflows “will continue to provide a strong technical bid for bonds since the primary market is so depressed right now,” Sabahi said. But the lack of issuance coupled with redemptions also adds to concerns about the high-yield market shrinking in Europe. This comes after years of cannibalization from leveraged loans, which have typically been the preferred route for sponsors in leveraged buyouts and are increasingly attracting high-yield borrowers looking to refinance their debt. Perstorp is the latest issuer to opt out of bonds by selling dollar- and euro-denominated term loans to refinance its existing notes. Another example is Nexi, which is set to repay outstanding debt and raise a new loan as part of its IPO plan. The par value of bonds outstanding in the ICE BofAML Euro High Yield Index peaked in 2015 at 317.0 billion euros and has since drifted lower to 275.5 billion euros, data from March 28 shows. Without new issuers coming to the market, “the market will shrink a little further until the end of this cycle,” according to JPMorgan’s Lamy. The trend may only reverse if a major economic downturn prompts credit-rating cuts, pushing issuers from investment grade into high yield, he said.